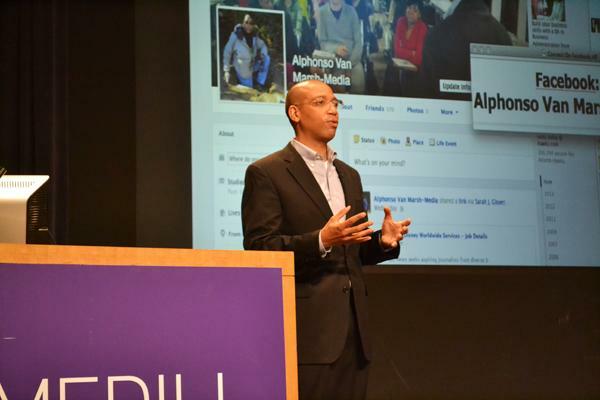 CNN reporter Alphonso Van Marsh (Medill ‘94) speaks Thursday afternoon at McCormick Tribune Center. Van Marsh has reported extensively from the Middle East and Africa throughout his career. CNN international correspondent Alphonso Van Marsh (Medill ’94) spoke Thursday at Northwestern about his experiences as a multimedia journalist covering the capture of Saddam Hussein. Van Marsh addressed about 30 audience members in the McCormick Tribune Center. He told the story of covering the American invasion of Baghdad, which led to the biggest break of his career. “When I was sent to Baghdad, I was not only a triple threat, I was a quadruple threat,” Van Marsh said, emphasizing the importance of being equipped with many multimedia skills as a journalist. In Baghdad, he stayed in a military compound that was frequently the target of car bombings. After currying favor with some of the younger soldiers due to the Internet access Van Marsh could provide them, he had a unique connection with the military that allowed him to break the story of Saddam Hussein’s capture. Van Marsh left his room one night to film troops returning to the compound, after hearing them celebrating. The night vision video he took was used to break the story of Saddam Hussein’s capture on CNN. Van Marsh emphasized that the ability to produce these stories singlehandedly as a “one-man band” is vital to his success and the success of future journalists. He said Medill courses are adequately preparing students with these skills, but the basics are most important while reporting in the field. “It comes back to good storytelling,” he said. Van Marsh also told the audience about beginning as a freelancer after graduating from Medill and carving out a niche for himself in the broadcast journalism world, being one of the few minority reporters active in the Middle East in the 1990s. He said his ethnicity helped him dissolve into the culture more easily, with many people mistaking him for having Arabic ancestry. This helped his cause as he managed all the challenges associated with reporting on one’s own, he said. “It’s a lot of balls to juggle at the same time,” Van Marsh said. Van Marsh talked about the four years he spent in Egypt learning about the country and its culture, all while attempting to work for CNN. While he grew acclimated to Egypt and began to learn Arabic, he covered stories on his own while freelancing for a handful of publications including The Sun, a U.K.-based publication. He told the audience every time he covered a story, he would send a photo of himself on a postcard to CNN’s office informing them he could be giving them these stories if they hired him. “Over time, CNN finally gave in,” Van Marsh said. This persistence eventually led him to become a correspondent for the network as the invasion in Iraq began. Attendees said they felt Van Marsh’s points about multimedia journalism were familiar, especially in Medill. Medill junior Alejandro Pallares, who is on the broadcast track, agreed that “one-man-band multimedia reporting is a critical skill for today’s journalists.” Pallares said he credits Van Marsh with making it the standard for journalism students today. “Alphonso’s use of digital news gathering to break the story of Saddam Hussein’s capture marks a key change in journalism history,” the former Daily staffer said.